We're thrilled to announce that we've launched a new label and presented both brands at an exclusively invited wine tasting event. During July the Skipper’s label was re-introduced as a tribute to the brothers featuring on the maiden vintage in 1998. This is on request of our importer in Japan who actively supports New Beginnings since its inception. New Beginnings are also exported to Germany since 1999, and to Poland since 2010. Wines from both labels remain popular with local and foreign clients. Skipper’s brothers logo – mid-level: blends. A tribute to the brothers featuring on the 1st label in 1998. Modern family logo – mid-level: single varietals. Will revert to colour logo. Renaissance sun logo – premium tier: Created in 2012 using 1999 label as base. Not yet launched. 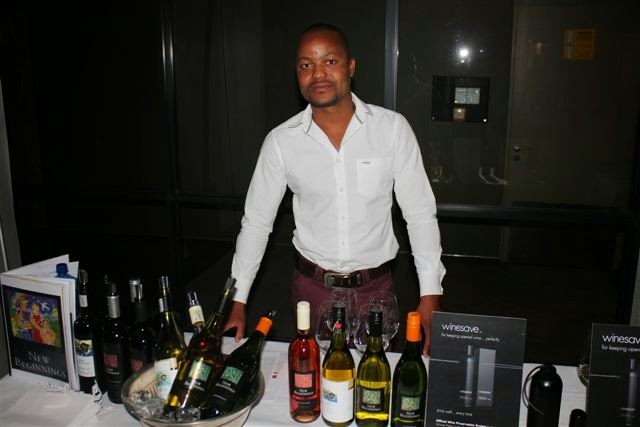 On 25th August Philani Shongwe, a Cape Winemakers Guild protege, poured both brands at the Directorate of International Relations & Cooperation Heads Of Mission & Ministerial wine tasting event at their conference in Pretoria to 400 delegates. He says "The Expo was phenomenal with the superb setting and delicious food from the stalls... Those who tasted liked the Skippers classic red & white blends, followed by the Chenin Blanc and Pinotage." Here are brief wine notes on the seven wines that Philani poured. * indicates screwcap. Unoaked. Sur lie. 50% wild fermented. Green hu with fresh complexity of citrus, lime, quince & white pear on nose. Interlayed with a creamy buttery soft secondary flavour that erupts fresh and crisp with length on palate. Fresh lime, Granny Smith apple & granadilla on nose and pallet. Tropical fruits, pineapple in after taste. On lees for 4 months. Cherry blush colour. Spicy, fruity, strawberry and cranberry with brisk, dry acidity. Cranberry, blueberry & cassis aromas combine with cigar box and hint of mint. A wine with structure and complexity. 12 months fermentation in French barrels. Ruby red colour with purple tinge. Intense nose of strawberries & cherries, enhanced by cinnamon & cloves. Soft tannins, concentrated pallet of ripe red fruit, plums, supported by spices & pepper. 50% Chardonnay, 50% Pinot Noir. Intense nose of ripe orange peel enhanced by ripe berries. Well rounded, medium bodied, crisp acidity, same on nose. Long lingering finish. Inky concentration with an unparalleled richness in mouth. 45% Pinotage, 21% Shiraz, 18% Cabernet Sauvignon, 16% Cinsault. Labels: "Anton Blignault", "Cape Winemakers Guild", "DIRCO HOM", "Family Collection", "New Beginnings Wines", "New Beginnings", "Philani Shongwe", "Skipper's Collection"